Using this calculator [ http://www.eeweb.com/toolbox/external-pcb-trace-max-current ], the board's traces can probably handle about ~3.56 Amps max. This is a great product and I highly recommend it to anyone. It measures current from AC or DC without any loss in load voltage. However there is a minor inherit problem. Because the output is Ratio-metric, which means with no load the out is 1/2 of Vcc. It also means if Vcc changes the output will also change that could cause inaccurate readings. A handful of people do try to read all the comments, but but if you need answers to technical questions Consider posting a new topic on the SparkFun forums in the SparkFun products category. If you're using this to monitor DC motor current, watch out for the motor magnets. When mounted a couple inches from our PM DC motor we got a huge (~0.5 amp) offset in the ACS712 output. So, back to the sense resistor for us. Aside from that the ACS712 seemed good. Is there any chance we could get this board with the 20 or 30 amp IC? 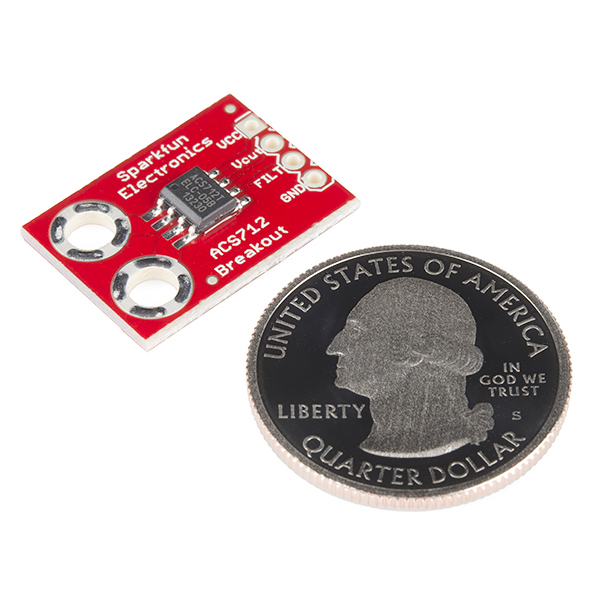 @SparkFun Some suggestions for next time you order more of these for stock. I love this chip, but the PCB design renders this BOB nearly impossible to use. Pull the ground plane fill away from the screw holes. If I tighten a nut down on these, it grounds out on the fill copper because it's too close to the holes. Don't even fill on that side of the chip; just leave the PCB bare. Use smaller holes. It's only measuring up to 5A - we don't need #6 screws for that. Holes that accommodate a 3.5mm screw terminal would be optimum because we could solder in wires or a screw terminal. Add a couple holes for a .1 in header, like you did on the low-current version of the board. Except make sure they line up so it can go into a breadboard. I totally agree. If you're measuring AC line voltage currents, I wouldn't recommend using this PCB -- the layout is downright dangerous. Whoever designed this board has obviously never done any mains voltage designs before, as this violates every creepage/clearance rule I've ever seen. Is there any chance we could get 20 of "ACS712" in one board? I vote for the 20 amp version as well. I would buy a few of them right now. 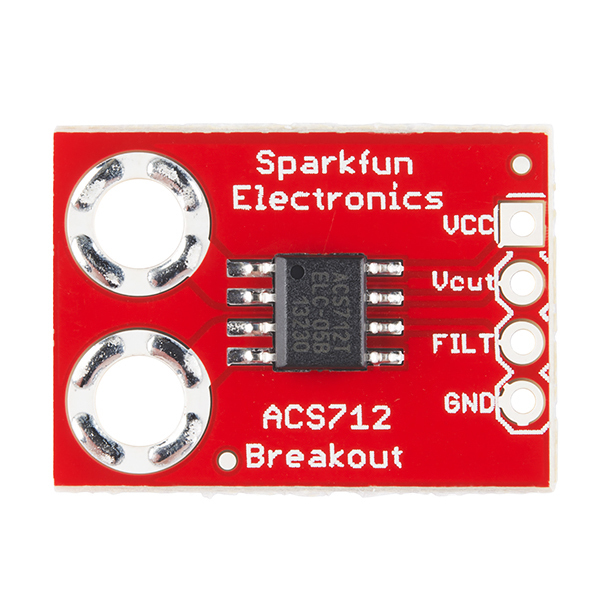 I am considering using this breakout board with the ASC725-20AB, which can handle upto 20A, instead of the ACS712, which handles 5A. The new chip that I would replace would be connected to a wall outlet (max 15A b/c of the circuit breaker). Do you think the "survival of the device up to 5 times overcurrent conditions" would let it be ok if I draw ~ 15A on this breakout replacing just the chip? As mentioned in the datasheet "This device can survive 5 times the rated current i.e. 100 A current". But looking at IC Package i.e. SOIC-8 100A current would not be safe. For much precautionary measures , bury the input sensing pin with extra solder metal. So even if the IC gets damaged the pad of the PCB would remain safe. BEWARE!! this breakout do not provide isolation to measure AC mains. The board layout do not have the required creepage (distances in the pcb surface) to measure voltages far from the microcontroller ground. A gap of 2mm under the IC and no ground plane in the bottom layer is needed to take advantage of the isolation offered by the IC manufacturer. " 2.1 kVRMS isolation voltage from pins 1-4 to pins 5-8" . Hi, I want to measure 5A output of a 220V 150/5A current transformer via this module. How do I do this? I need to monitor the amperage of a 460v 3phs pump. The load will be 2-3 amps, and I want to use one sensor on each of the legs. Will this sensor handle that voltage? In case this saves someone some time (since I just worked this out the hard way)... you can't use a current sensor with a stepper motor. Stepper motors run at full current all the time (so they can lock their position) so you can't detect (for example) an increase in current draw with an increase in load for current-control of the motor. I'm not so sure this is true. Stepper motors may have a constant current when it is holding a position (because the load is purely resistive during that time). When a there is some dynamic loading on the motor , there will be some transient change in current draw that should be seen in the phase windings. Not to mention, when the motor is actively being stepped, there will be transient currents during the active switching of the phase coils. A way to monitor the DC current used by a stepper motor, would be to measure before the switches (ie. monitor the current supply to the h-bridge V+ supply, assuming an h-bridge is used). What formula is everyone using to convert Vout to current? At 0.5A, I get more or less accurate readings but wild swings at 0.01. People below me in the commends have said they go 6mA accuracy and I'm wondering if I'm calculating wrong. The output is an analog waveform that tracks the sensed current (with a DC offset of +2.5V assuming you're using a 5V supply). What type of capacitors are those on the wiring example? Where can I find them? Is it possible to measure slightly more current than 5A with this? Say 7A or 8A? It senses current, not voltage. So the supply voltage is irrelevant (except for possible isolation concerns). the 1nf cap should be included. If we are measuring AC current, does it matter which terminal we connect the hot and neutral to? Nope. Either way will work. But put this in line (series) with your load. I will probably swap out the op-amp for a peak detector amplifier, I just need a Current/No Current detector that does not need re-calibrating with every current change . Can anyone advise me!! I just tried using the ACS712 board but for some reason I only get 0.60v of response from the Vout even if i don't put any current source, which should give me 2.56v if the Vcc is 5v. Could it be that it got burnt when i was solding it? Or is there another posibility? what kind of header can you use for the big holes? Just a quick warning to not use this to sense your main Utility Line. Most of them in the US have a 200A breaker, which means that you could see as much as 200A in the line, which from the description above sounds like it would burn out the sensor. That said, most house circuits have 20A breakers, which shouldn't burn out this part, but it might not give you the data you want. For sensing current through the mains, you'll probably be much better off (and safer) using a clamp-type current sensor such as the SEN-11005 in the related products below. 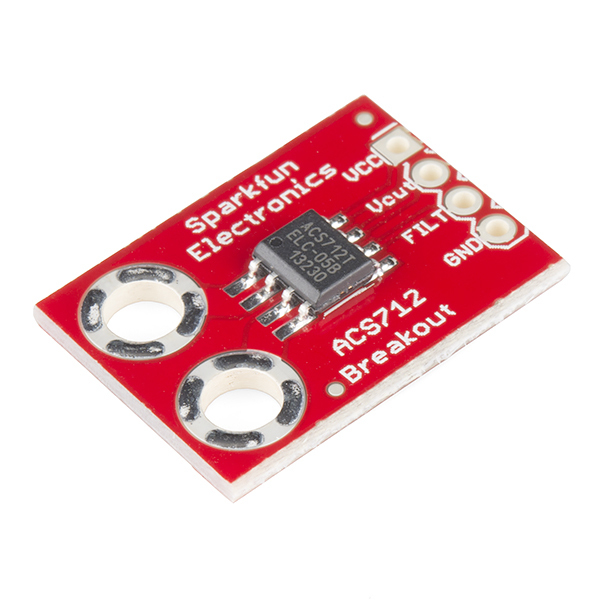 Is it possible to use this sensor to measure the input voltage being supplied to the controller to which this sensor is attached? Or is this only used to measure voltage/current on everythign but the power source to allow the sensor to operate? Noob question here: What terminals should I add to the current pads to connect 14AWG wire? It measures whatever current you run through it. Voltage is irrelevant. There is also a 20A demo board. hows about getting a version of the ACS714 like Pololu?? A +/-30amp version is a bit more suitable for robotics. I have used them and they work very well, would probably fit on this board. Don't you think this is a bit overpriced? It came down in price. Could we get the cross sectional area, conductor width, and #oz. copper for the current traces? I'd like to compare them to the IPC Temperature Charts to see if your breakout board (with the ACS712-5A already supplied) can handle the 30A version. Or, if it's already been proven to work superbly under that condition (tested at 30Amax), I could just take Sparkfun's word for it. Thanks! Mark the 'positive' current direction on the board mask, for the two big holes (with an arrow ideally, or + and -). Also, standard size holes for the current connectors would be nice, to make it easier to connect headers. Perhaps in addition to the big holes? I'd like to solder some standard male headers to the current pads, in order to be able to plug the board into a breadboard for prototyping. Could anyone advise as to if that would work (filling the remaining space with solder), or give some tips? It would work, it would just be clunky. Use the breadboard as a jig. Make sure you don't get a massive blob of solder onto your breadboard. Is there a description of how to calibrate these things online anywhere? I'm using the 20A version of this chip in a device to sense mains current @240V/50Hz (Australia). It handles it just fine. the ACS712 is rated to 5A and after searching around on the web for projects using this ic at 220v i would say its usable in europe. the datasheet mentions a Peak Basic isolation voltage of ~380 Volt which could be the maximum voltage the ic can handle. i hope this answers your question. Haven't quite got to the point of using and testing the units yet (6). My project is a 1.5 KW Vdmos Linear amplifier. I'm using the 712's for closed loop bias control. 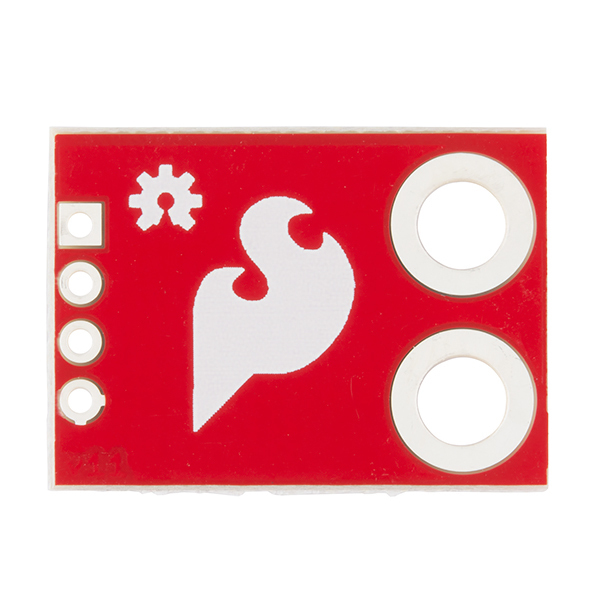 The fit and finish of Sparkfun products is always spot on and I've never had one problem with their products. I hope to have this project online in the next month. Anyone get this to work? I could not. I have tried using nuts and bolts to attach wires, soldering, and crimp things. Everything is a pain, extremely difficult to use, and extremely easy to short. Also, I had to dig pretty deep to even get an explanation on how it worked and how to set it up aside from the super basic explanation on sparkfun. Also, would be nice if one like I mentioned above came in 30-50A version.